Musser's Classic Bells are the finest high-carbon tempered steel, carefully hand tuned with a specially designed bar mounting system to deliver unsurpassed tone, clarity and resonance. 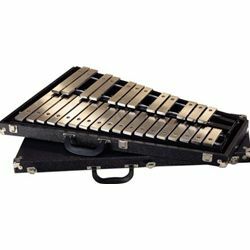 The 2.5-octave bars are nickel plated with a satin finish. Classic Bells have a vinyl covered wood case with sturdy steel hinges, latches and double handles for carrying security. Optional stands include a folding table, and a compact folding stand. Another option is the small mallet instrument cart with large swivel casters. The cart is height and length adjustable and retrofits small instrument accessories.